So the stars did not line up for So Cal Quilt Run and I was not able to hit the road yesterday and do the whole 4 day trip like I wanted to. I’ve got a work project that is slightly behind schedule which means, I can’t take time off. Part of me wanted to just forget playing this year since I can’t play 100% but as the day got closer and closer, I thought that was ridiculous and I can at least try to hit some of the areas. Yesterday I left work a little early and was able to hit 3 of the 7 shops in Area 1. In addition, only one of the kids was able to join me since DS is in baseball camp this week and next. This is my favorite shop! There are other local shops in my area that are actually closer to my house but I trek over to this shop before going to any others. It’s actually down the street from my office so it’s not too much of a trek if I go after work. 🙂 Anyway, this shop is primarily known for repro prints (civil war, thirties, etc.) It’s been around for ages – I believe over 30 years now. I took traditional quilting classes with the previous owner. Since the new owner took over a few years ago (the previous one retired), more modern fabrics are taking over the shop. The drawback is that the shop is small and they just don’t have the space for all the fabric. I don’t mind, though, because a lot of fabric is off the shelves and I see more of it which in turn means I buy more of it. 🙂 In addition, fabric hits the clearance section faster because they are constantly trying to make room for new fabric. The staff is friendly and helpful. This shop is a lot bigger than my LQS and I’m not sure why I don’t head over here more often. It’s only 30 minutes away and if my LQS doesn’t have something I need its not too far for me to go. But I only go here during the quilt runs. There’s a lot of fabric and the staff during the run is very friendly. 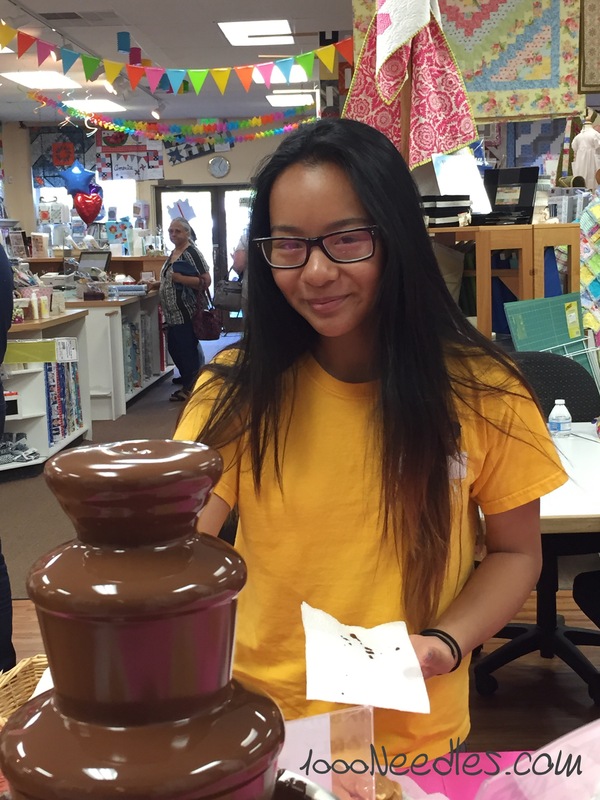 IN addition, they’ve got a chocolate fountain set up in the back. When the kids were young I was terrified that they would get chocolate on something and herded them out of the store as soon as I could. Now that DD is older, we were able to look around, chat, and plan the next part of the trip. Fifteen minutes away from Cotton and Chocolate is Quilters Studio. They are primarily a Bernina dealership. They have fabric and quilty stuff too but not as much as the first two quilt shops. I bought my Bernina from here. To be honest, I don’t like this store very much. I don’t like to be negative about a small business but this is a business and I should let you all know what I really think of a place. Honestly, if I had known I could have gotten my Bernina from a closer shop I would have gone there. The fabric selection is small compared to other quilt shops I’ve gone too. But that’s not the issue – the staff is not very friendly and there’s a vibe in the shop that I don’t like. They’re not overtly rude but I get a negative feeling everytime I come here. 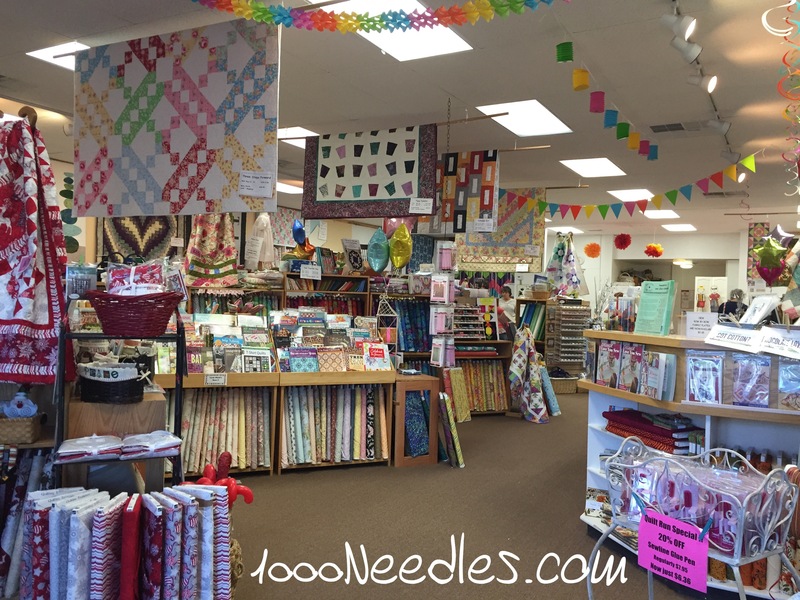 Obviously it might just be me but I’ve gone to a lot of quilt shops especially in California and there are a handful of shops that have a vibe like this one. If it wasn’t for the run, I wouldn’t come here. There are 4 more stops in Area 1 and I hope to get off a little early today to hit them. There is one all the way up in Lancaster and I’m not sure I’ll be able to get there today. I may save that for Sunday when I can avoid traffic. But, I really want to get Area 1 done today so I will try to get out early enough to beat the traffic over there and back. I didn’t buy anything! Which is great! Each shop is giving away a fat quarter of Robert Kaufman fabric and with DD and I going, we’re getting two of each! 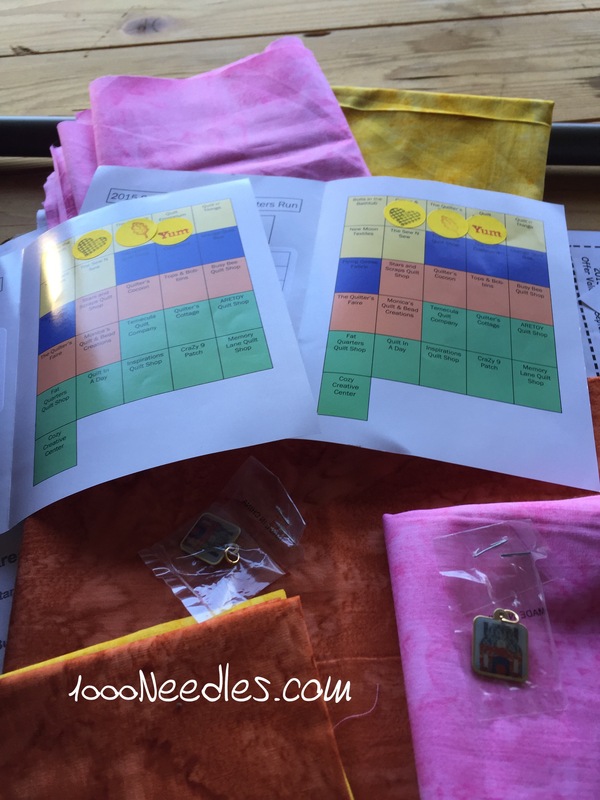 We get a free pattern and other little goodies like the charms above. I’m so glad you got to get out and play yesterday Melanie! 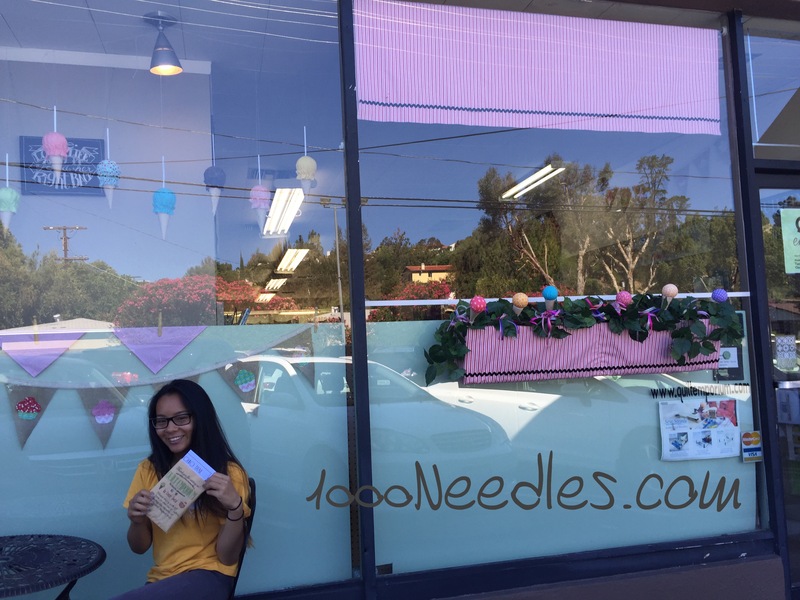 Katie and I hit three Area 1 shops: Quilt ‘n’ Things, New Moon Textiles and The Sew ‘N’ Sew. Today we’re heading out to Area 3, and might hit up some shops in our Area 2 time permitting. Thank you SO MUCH for posting and informing us about the SoCal run! We’re having a blast! Oh, one more thing…I totally get the “vibe” thing. I’ve had the same experience. I’m right there with ya! 🙂 I’m so glad it is not just me. 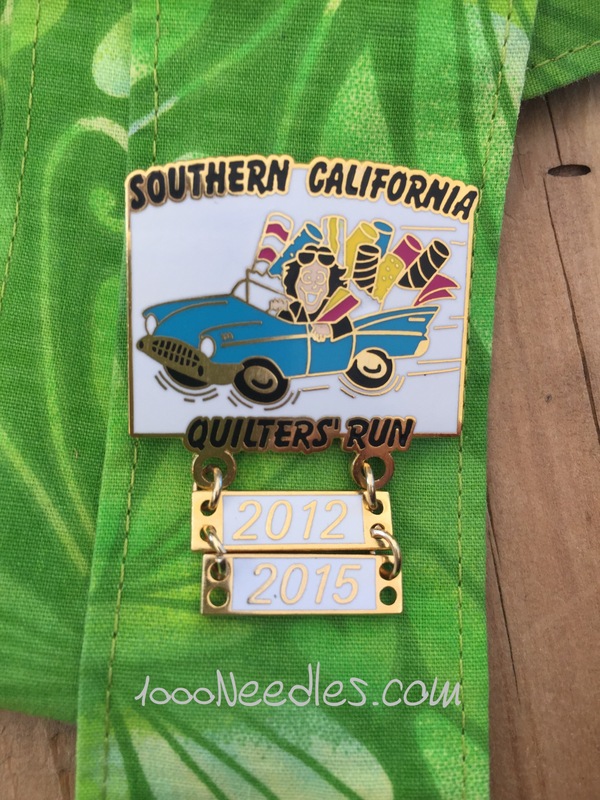 I’m so jealous — The Quilt Run is such a great idea. Enjoy yourself! After seeing this post, I realize that you must live close to where Fran did! She was in Chatsworth and then Woodland Hills. Her folks lived in Thousand Oaks. Cotton and Chocolate is one of my all-time favorite U. S. shops! Marilyn is a sweetie. That’s the last shop Fran and I visited before she died. 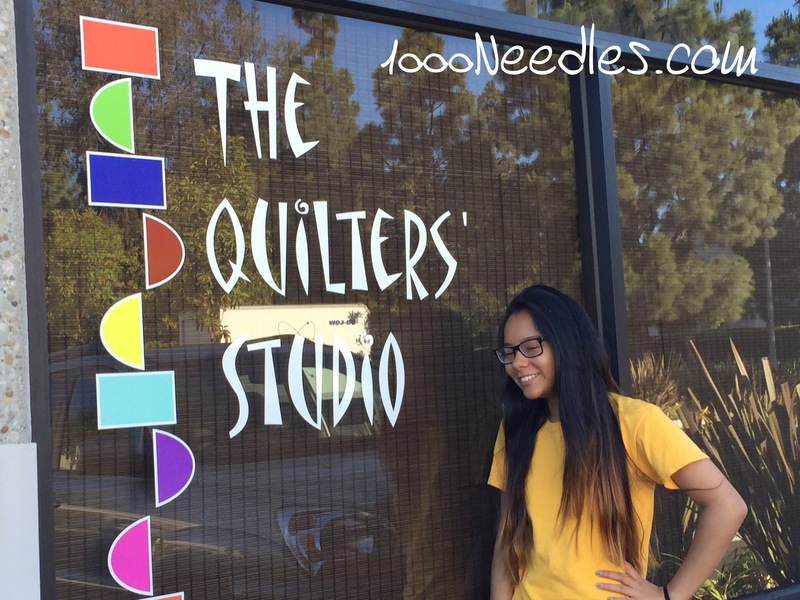 Quilt Emporium was just down the street from her condo – sort of – and we went there a lot, too, as well as out to Newbury Park – and lots of others. I even belonged to the Conejo quilt guild for a couple of years and helped Fran with their quilt show. She also belonged to SFVQG, and we used to go to meetings together when I visited. How funny! We might have met at some point!